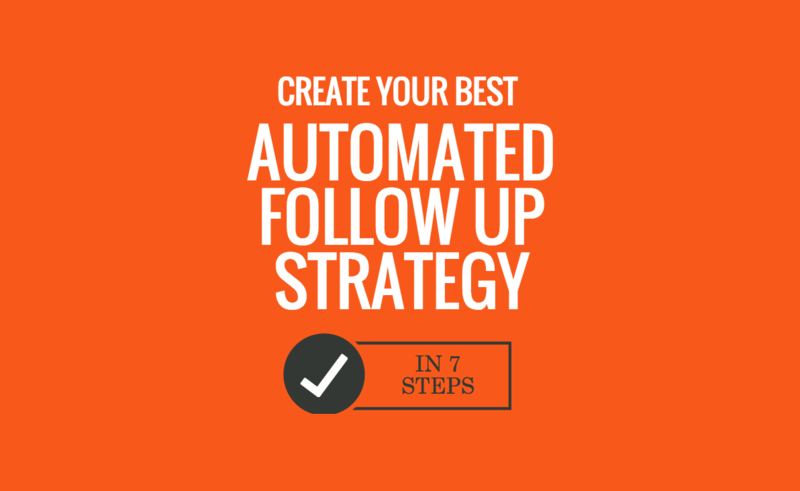 Are you using the best automated follow up strategy? Or are you letting business slip away? You have a new contact. A new customer. A new lead. This is the moment when someone is most interested in what you have to say. When people want to hear from you. An effective follow-up sequence is a crucial tactic for your business. And when you can automate that sequence, it becomes even more effective. Once you set it up it runs—and nurtures leads into customers without any extra work. Whether you are in the process of creating your first follow-up sequence or you’ve been at this for years, your follow up sequence needs to be strategic. It should be the result of a specific plan designed to achieve a specific goal. Unfortunately, follow up is often created on a whim or pieced together bit by bit over time to fill in gaps. That means most sequences aren’t created to achieve specific results—and in fact don’t achieve much of anything. How can you make automations that tackle your specific business problems? This video, from the free course Getting Started with ActiveCampaign, shows you where to begin. As importantly, a lot has changed since you created first created your sequences. There are powerful new marketing tools out there. You know more about your customers. Your product line has changed, or you’ve learned more about effective online marketing. Your follow up sequence needs to be updated. This post is about how to re-envision your follow up—and implement everything you haven’t gotten to but should. Your automated follow up is the neglected workhorse of your online marketing… which is a shame because it’s one of the most powerful tools at your disposal and pretty much all your leads and customers will experience it. We obsess over the smallest detail of our website and might go months without even thinking about our automated follow up marketing. Day in and day out, your automated follow up brings contacts back to your site, builds a relationship with them, creates and nurtures qualified leads, drives conversions, contributes to customer satisfaction, and saves you untold time. Automation is one of the best ways to follow up with customers—so it’s certainly worth the effort it will take to make it better at doing all those things. What follows is a 7 step process that will produce a unique follow-up strategy for your business, make sure you are automating and accomplishing as much as possible, and improve the overall experience for your contacts. Any time you spend on this will pay dividends over and over as your automated follow up is experienced by each new contact. In fact, you aren’t spending time at all, you are investing it in one of the highest-leverage activities in your business. Marketing is tricky, but it can grow your business. Put in your email below to get one message a week (with marketing advice like this article). 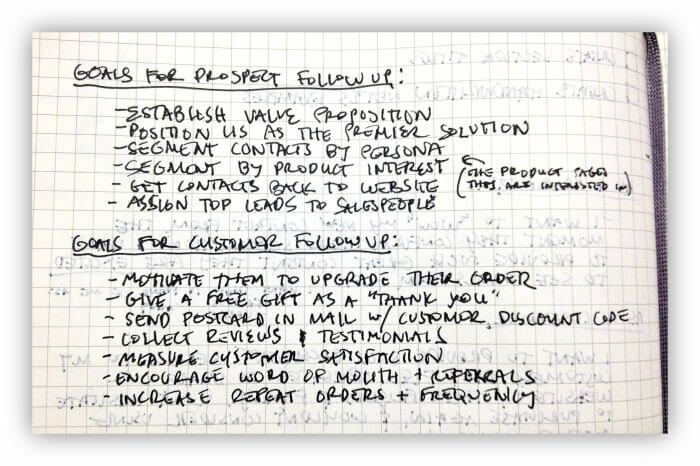 To develop a new, improved strategy, forget your old follow up sequences. Mentally set them aside and start over from scratch with a fresh perspective. We are shooting for a complete, “top to bottom” overhaul of your automated follow up. Modifying or adding to what exists would only lead to incremental improvements. Instead, we will create something entirely fresh and inspired to achieve a major leap in performance. We are going to develop two separate follow up sequences — one for our prospects and one for our customers — because our focus changes after their first purchase. At that point we shift from helping a contact understand why they should do business with us, educating them, and building trust, to customer service, encouraging repeat purchases, and getting referrals. As you create your new follow up strategy, you want to be guided by a clear picture of the ideal experience you want each contact to have before and after they make a purchase. This “perfect” customer experience won’t happen on its own… we are going to make it happen by envisioning it, defining it, and then working toward it. So imagine the ideal experience you want each contact to have, and create a short summary describing the experience you want them to have as a prospect and then the experience you want them to have as a customer. Keep these descriptions short (2-3 sentences, tops). It’s okay to strive for a multi-faceted experience, but don’t go overboard. Focus on just a couple important things you want them to get out of your follow up marketing. This isn’t making a plan, just picking a destination so you can be sure you end up where you want to be. 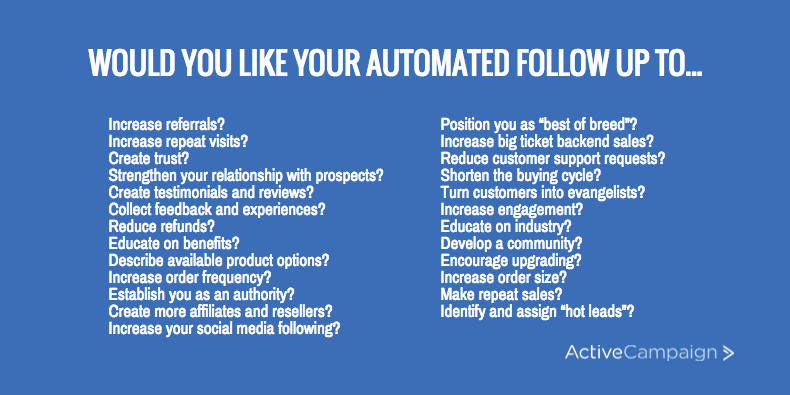 Think of this as the mission statement for your automated follow up marketing—it should be inspiring, but not specific. I want to “wow my new contact from the moment they confirm their subscription. I want to provide such great content they are excited to see emails from me. I want them to think of me as a friend, ally, and expert. If the summary statement you just created is your destination, now we are going to choose all the stuff you’ll get done en route. Strengthen your relationship with prospects? Establish you as an authority? Create more affiliates and resellers? Increase your social media following? Increase big ticket backend sales? This is where you pick the results your follow up produces so take your time. These goals shouldn’t be specific or measurable. In fact, it’s better if they aren’t. We are just creating a wish list. In the next step we’ll focus on how you’ll achieve these goals and we’ll make them specific and measurable then. Don’t concern yourself with how you are going to accomplish any of this, at least, not yet. That will only stifle your creativity and needlessly lower your ambition. Instead focus on what you’d like to do without limiting yourself to what is feasible or realistic. As ideas come to you, write them down in a big, unorganized list. The more ambitious the list, the better… stretch the limits of what is possible so you’ll create an automated follow up sequence that does everything it can for you and your contacts. 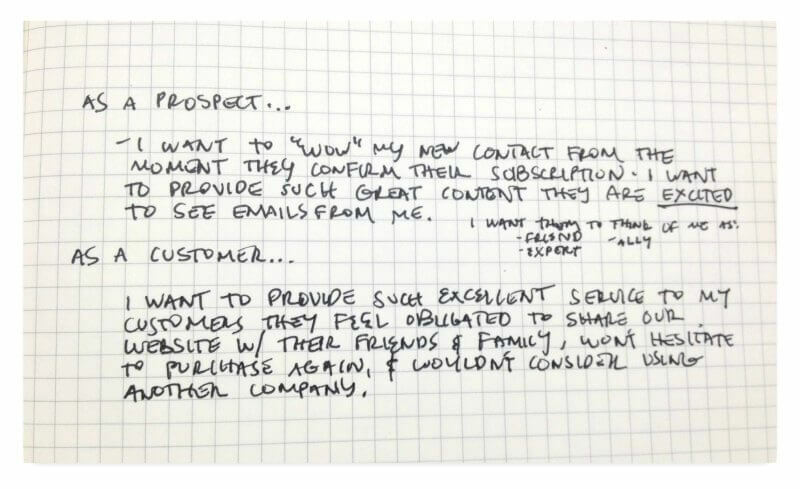 Separate your goals by whether they are pre-sale (prospect) or post-sale (customer). Then put them in chronological order as well as you can (you probably won’t be able to do this perfectly). If you feel you are done with this step, check your goals against the experience you defined. 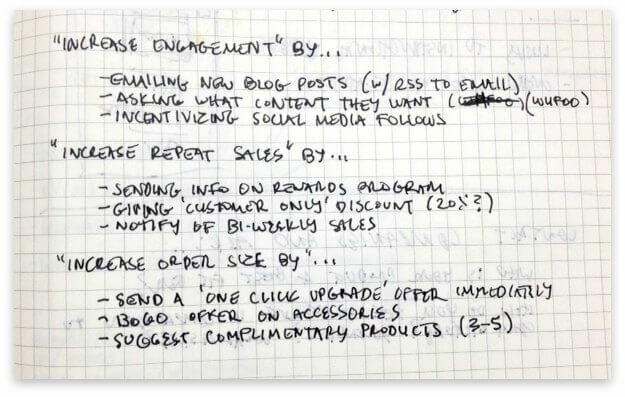 Are enough of these goals centered on the customer and creating a good experience for them? Put a lot of effort into brainstorming all the ways you could accomplish these goals. Again, don’t limit yourself to what you think is feasible because you’ll needlessly wall yourself off from some of your best ideas. Just list off every idea you have for how you could reach a goal. Don’t stop when you’ve got 3-5 good ideas, keep pushing yourself. Your first five ideas will be very safe, and probably things you’ve been considering anyway. If you do it right, this step will generate some of the best ideas for growing your business you’ve had in a long time. Circle, star, or underline the most brilliant ideas you came up with. When it comes to laying out the exact follow up and email sequence, pen and paper might be the best way to hammer out the first few drafts — just make sure you’ve got plenty of paper. There are going to be false starts, arrows that go no where, scribbles, and cross outs. If this is easy, and you aren’t confused by how this all is going to come together, you might need to back up and try the steps again because you probably weren’t ambitious enough. This should feel like putting together a puzzle — you’ve got the pieces and now you are trying to figure out how they fit together so they guide prospects through the stages of the buying cycle and solidify your relationship with your customers. All the while taking care of their needs and keeping them interested. Don’t get caught up in the details — you can worry about the settings required for logic or subject lines for your emails later. Just scribble out the overall process and get down the basic order of events. Maybe make some notes if you get a flash of insight but you can fill in the majority of the specifics later… this is still “big picture” time. When it’s time to fine tune the magnificent follow up sequence that is emerging, try out our automation builder. If you’ve used it, you know it’s a surprisingly powerful and easy to use tool—laying out a marketing automation sequence is as easy as reading a flowchart. Even if you are using another marketing automation service right now, you can sign up for a free trial and use our automation builder to map out your follow up. You’ll want to evenly distribute these messages throughout your automated marketing sequences. Unfortunately your prospect isn’t paying attention to everything you say so you might need to be somewhat repetitive to make sure they hear your core marketing messages. Don’t be afraid to repeat yourself on important points so you can be sure your prospect is getting the right message even if they missed part of your email sequence. Make a list of what you need to create to make this happen. It’s probably going to be mostly content you need to create, such as emails or free reports, but there might also be entirely new projects you need to plan out — like a implementing a refer-a-friend program, creating a “one-click upsell” script, or some graphic design work you need to outsource. It might be helpful to use a project management application so you can break it down to actionable steps and plan the resources required for each project. It’s probably going to take a while to implement your new automated follow up strategy so you have an opportunity to make sure you’ve mined your old follow up sequence for all the data it holds before switching over. If you haven’t already, identify key metrics you can use to measure the performance of your marketing so that you can compare the new and old follow up email sequences. This new follow up strategy should perform better than your old one but you want to be able to establish that as fact. You can only do that if you know the numbers. If you haven’t already, make sure you set up our Google Analytics integration so that you can track link clicks in specific emails and automations. You can also see how contacts go on to interact with your website and know what purchases and “goals” your email marketing and marketing automation are responsible for. While you are thinking it terms of analytics, figure out how you will measure performance for all the goals we created in Step 2 and the individual components of your email sequence we created in Step 3. Define the specific metrics that are key to indicating performance (KPIs) and set up a schedule you’ll stick to for reviewing and assessing the different components of your follow up, so that it continues to progress until your next complete reconsideration. If you repeat this process every year or so you can keep creating experimental sequences—through email and other marketing channels—to beat the performance of your proven, “control” sequence. That way, you can keep challenging your best work and continually strive toward that ultimate, unbeatable follow up sequence that automates as much of your business as possible and produces happy, satisfied customers out of your leads.